Toothsome, nutritious, and satisfying, this dish is not at all Asian, however. I am a big believer in factually representing any product. Thus, I was very surprised by the recipe, which inspired this post. The original recipe came from a cookbook called, Everyday Asian , by Patricia Yeo and Tom Steele. At a bookstore in Vancouver, I bought a copy of Everyday Asian on sale, as I liked to do when indulging my compulsion bad habit hobby of buying cookbooks. It looked like a fun and diverse collection of pan-Asian recipes. I liked the simplicity of the recipes I reviewed and the variety of approaches (including substitutions and options for many ingredients, techniques, and variations). I am always on the hunt for new approaches in synthesizing the exciting range of Asian cuisines. Of Chinese descent, the author grew up in Malaysia, received her culinary training in France, worked at China Moon Café in San Francisco, and then worked for Bobby Flay at the Miracle Grill. So it appeared that Ms. Yeo knows a thing or two about Asian food. Roasting broccoli is a breeze. Ms. Yeo’s stint at Mesa Grill would explain the corn salsa (not an Asian ingredient or technique in sight). Of course, the maple vinaigrette might qualify, given its use of rice wine vinegar, if we were to stretch the definition of “Asian” so much to include all of Canada (80% of the maple syrup is produced in Canada, but I betcha you didn’t know that, eh?). In the dessert section, the author’s French training is evident in the crème brulée certainly, but there were absolutely no Asian touches there. Nor would “Basic Buttermilk Shortcake Biscuits” make one think: “Wow, that’s Asiatic cuisine at its finest!” However, I was most intrigued by the linguine with roasted cauliflower, bacon, and pine nuts. 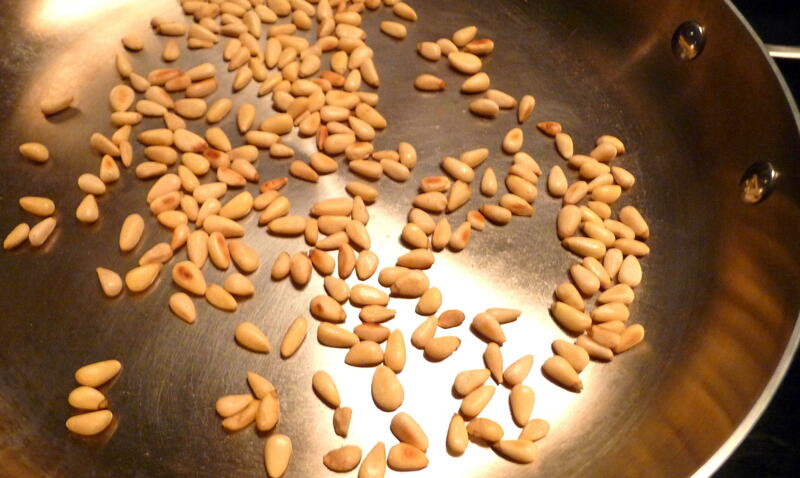 Keep a close eye the pine nuts, as you dry roast them. I decided to try this last recipe – not because I could find anything Asian or even vaguely Asian in it – but because it looked tempting and I had all the ingredients on hand (OK, some broccoli in the fridge which had seen better days, and Iwanted to use up the last bit of prosciutto). One other addition of mine was to throw a dusting of grated Parmigiano Reggiano on the pasta; how could I resist? Whether it is a quotidian Asian recipe or not, the pasta turned out to be delectable. The many variants the author included in the recipe were very helpful (e.g., use Brussels sprouts instead of broccoli, substitute croutons for pine nuts, or eschew the linguine altogether – and use the rest of the ingredients to stuff ravioli or serve as a side dish with chicken). Onions, garlic, and prosciutto, who cares if it's not Asian? Funny how one starts out with the vague plan of some kind of everyday Asian dish for dinner yet winds up with something that is typically Italian. That is how life goes…everyday in Asia, Italy, Canada, and everywhere else. 2. 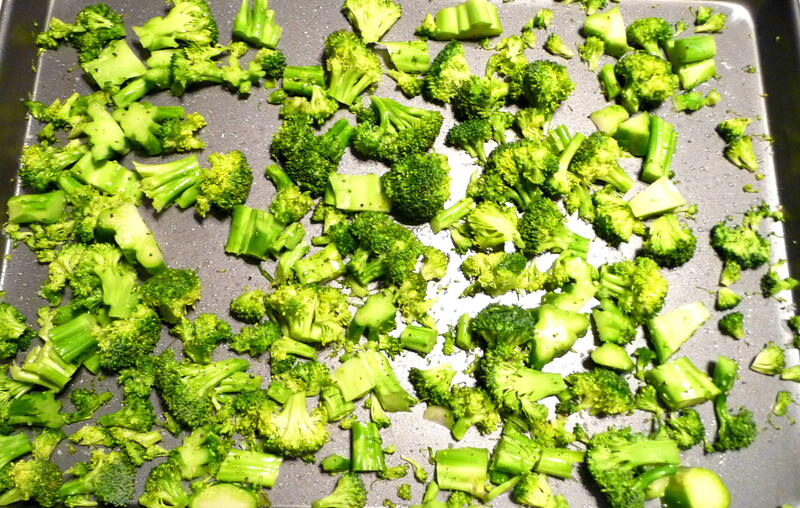 Toss the broccoli with the canola oil, season with the salt and pepper, and roast for 10 to 15 minutes. Stir from time to time, making sure that the broccoli does not burn. 3. Boil the water for the pasta when the broccoli goes in the oven. 4. Toast the pine nuts in a small pan on medium heat on the stove, watching carefully so they do not burn; remove from heat. 5. Cook the pasta according to package instructions. 6. 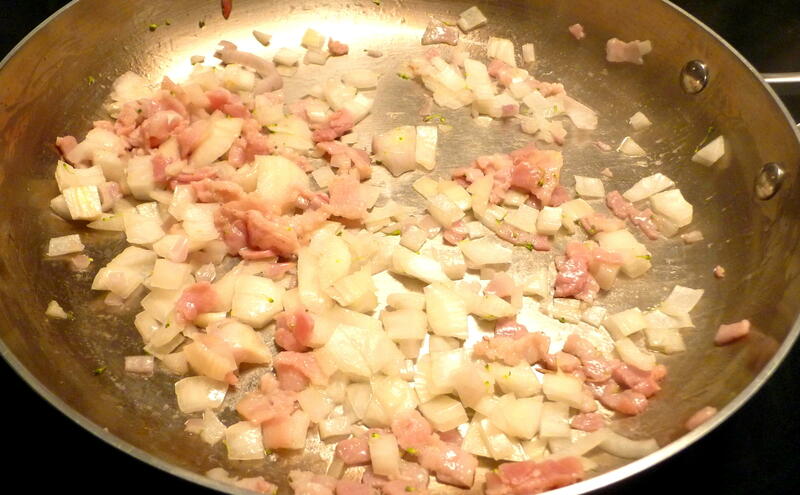 While the broccoli is roasting, saute the prosciutto with the onion. garlic, and thyme until the onion is golden brown. 7. Add the roasted broccoli to the prosciutto mixture and toss it with the pasta, adding a bit of the reserved pasta-water, as necessary to loosen up the mixture. 7. 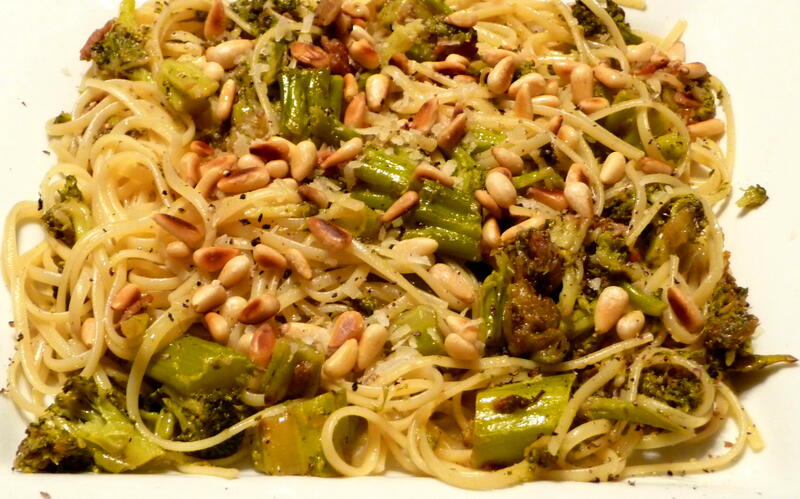 Plate the pasta and sprinkle with the toasted pine nuts. Drizzle with a bit of extra-virgin olive oil, if desired, and lavishly finish with a blanket of Reggiano, if desired. 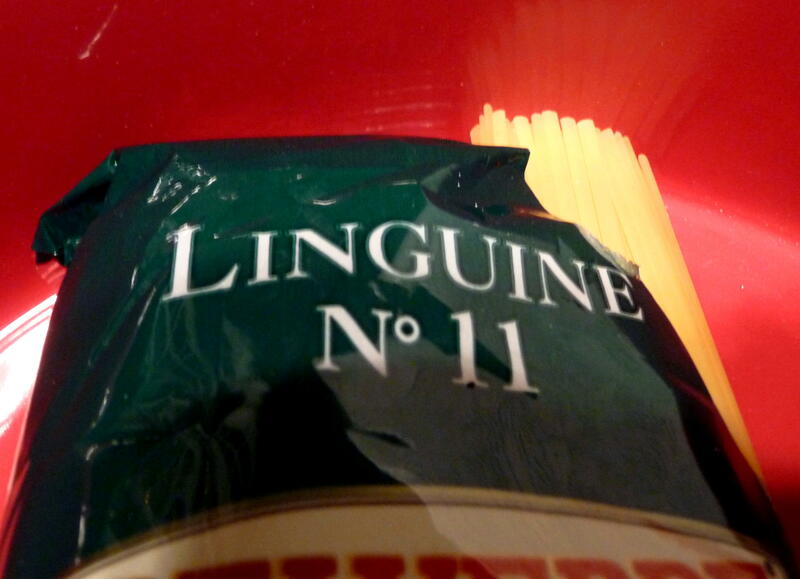 Linguine "no 11" - now that's Italian! 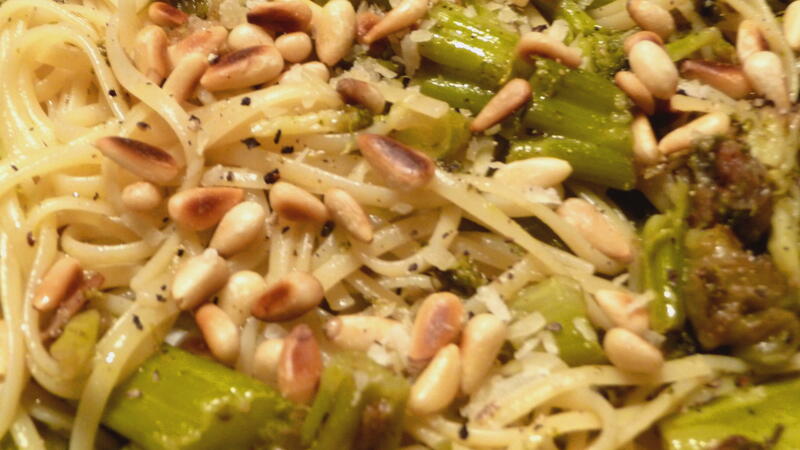 This entry was posted in Main courses, Recipes Misc and tagged Dinner, Italian, nutritious, pasta. Bookmark the permalink. Oh, but you hit it out of the ballpark! It’s certainly easy to fall in love with the colors and textures incorporated in this wonderful dish. You may call it Asian or Italian. I’ll call it delicious! Have a wonderful weekend Dan! Thanks, Marysol. You’d like this dish – maybe with a bit of hot pepper thrown in to perk it up? I hope you have a marvellous weekend, too. That is one delicious looking linguine! If you’re after a pan-Asian recipe book, look for Charmaine Solomon’s “The Complete Asian Cookbook.” It truly is pan-Asian. Thanks for the comment and suggestion. While I know of Charmaine Solomon’s reputation, I’ve yet to buy that book – another for the list! Must try this dish, sounds and looks good and yes with the hot pepper! Dan, I do have Charmaine Solomon’s book. Could be I gave it to the library. I will look. You’d like the peppery version, Kip. If you still have the Solomon book, I’d love to borrow it! Hey Dan, this looks wonderful. I like the way the broccoli looks well cooked. I like crunchy broccoli too, but sometimes I just want soft veg (reminds me of childhood)! By the way, i have a lot cookbooks too, but I never thought of it as an addiction-maybe it is though??? Thanks very much, Stella. The roasted broccoli depends on your taste – I prefer it crunchy, but this time, it was on the softer side. I love adding them to rice. Thanks very much, Alba. I’d suggest stocking up on pine nuts, when you next find them, and either freezing or keeping the fridge. I find that most shelled nuts keep for many months when refrigerated – and much longer frozen. Living on an island, I need to know these food preservation pointers.